A base salary of $1 per year. In doing so she’s following the example of another well-known CEO who just stepped down from his job: Former Apple CEO and now Chairman Steve Jobs. 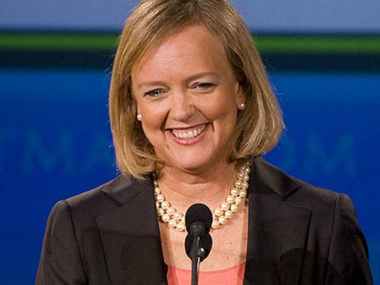 An option to purchase 1.9 million shares of HP under its 2004 stock incentive plan. The exercise price would be equal to the market value of the share price on the grant date. The options will vest over eight years, but are considered fully vested only if HP’s share price rises by 40 percent or more. As of today that number of shares is worth $45.2 million. 100,000 of those shares will vest on each of the first three anniversaries of Whitman’s anniversary of service, provided she’s still on the job. An additional 800,000 of those 1.9 million shares will vest after one year, provided HP’s share price has risen by 120 percent and stayed that high for at least 20 days. Yet another 800,000 of those shares vest on the second anniversary of her date of service, provided the share price is up 140 percent or better for 20 consecutive days. Whitman will also get the same annual cash bonus of $2.4 million each year, with a maximum equal to 2.5 times the target of HP’s existing incentive plan, which is tied to cash flow performance. If she’s fired, she receives a severance benefit payment equal to 1.5 times the sum of her annual base salary — a whole $1.50 — plus the average of her bonuses paid during the preceding three years.